Developed by the Government of Quebec and the Canadian Federal Government, the Quebec Skilled Worker Program (QSWP) enables highly educated and trained foreign nationals to immigrate to Quebec as skilled workers. Prospective immigrants who apply to the Skilled Worker Quebec Program are evaluated according to a selection grid of factors, and applicants who score enough points are given a Quebec Selection Certificate (CSQ) which they can then use to apply for Canadian permanent residency. UPDATE: A new 2018 Quebec Skilled Worker Program intake period (maximum 5,000 applications) should be announced shortly. Eligibility for the Quebec Immigration Skilled Worker Program is determined by nine selection factors. Quebec Skilled Worker Program points are awarded according to these Immigration Quebec selection criteria in order to identify which possible immigrants are most likely to flourish economically once in Quebec. To qualify for immigration to Canada as a Quebec-selected skilled worker, a solo applicant must score at least 50 points. Potential immigrants who apply with a spouse or a common-law partner must score at least 59 points in order to be eligible for the QSW Program. We have outlined each of the skilled worker immigration Quebec requirements in detail below. Questions about your eligibility for the Quebec Skilled Worker Program? Contact us today for a FREE consultation. As many as 26 points are awarded under the Training category of the Quebec Skilled Worker Immigration Program. These points are given across two sub-categories: Education (up to 14 points), and Areas of Training (up to 12 points). The Education sub-factor has a minimum cutoff score of 2 points, which means that applicants must have obtained at least a secondary school general diploma in order to be eligible to become a Quebec-selected skilled worker. The level of education must also have been attained in the five years prior to applying for the Quebec Skilled Worker Program. Otherwise, the prospective immigrant must have worked in a field directly related to their degree or diploma for a minimum of 12 months in the five years before submitting their application. The Areas of Training sub-category is intended to identify potential immigrants who are professionally trained in areas with strong job prospects in Quebec. A detailed Quebec Skilled Worker Program list of Areas of Training is available to help prospective applicants determine which section their degree or diploma is classified under. As many as 8 points are available under the Quebec Skilled Worker Program Work Experience category. Eligible work experience must have been gathered in the five years preceding submission of the Skilled Worker Program Quebec application. Eligible job experience includes both paid and unpaid employment. However, unremunerated employment and internships must have been undertaken in accordance with a training or educational program. The economic immigration program is designed to attract potential Quebec skilled workers who will have long and prosperous careers in the province. Consequently, the Quebec Skilled Worker Programme Age selection factor rewards young prospective immigrants with up to 16 points towards their eligibility score. As many as 22 Quebec Skilled Worker Program points are available under this selection factor. French language skills are preferred by Immigration Quebec, and consequently, French language proficiency is weighted more strongly than English language proficiency with an opportunity for the applicant to score 16 points for French compared to 6 points for English. Immigration Quebec accepts several different English and French evaluation tests and diplomas from the Centre international d’études pédagogiques (CIEP), Chambre de commerce et d’industrie de Paris Île-de-France (CCIP-IDF), and International English Language Testing System (IELTS). Attestations of standardized test results will not be accepted from other organizations. Candidates are adjudicated on written comprehension, written production, oral comprehension and oral production. In general, a person is classified as a "Low Beginner" if they are only able to comprehend short or common phrases, and express simple things. A "High Beginner" is someone who is able to comprehend basic day to day information, and express themselves effectively in standard situations. A person is considered a "Low Intermediate" if they can understand most information they hear in typical situations, and are able to communicate effectively in most day to day scenarios. A "High Intermediate" is a person who can comprehend detailed info regarding a wide variety of subjects both standard or abstract. They can also speak clearly and effectively about many topics they are interested in. An individual is considered "Advanced" if they can understand complicated information in both professional and casual settings, and can clearly and confidently communicate on a wide array of topics. Please note: while it is significantly more difficult, it is possible to immigrate to Quebec as a skilled worker without speaking French or English. Quebec skilled immigration applicants who have spent time in Quebec or have family in the province can be awarded as many as 8 points under this selection factor. The sub-category for having family members in Quebec offers up to 3 points, while the Stay in Quebec sub-category can provide up to 5 points. Please note: family members who reside in Canada but not in Quebec do not count under this category. Points are only awarded for relatives actively residing in Montreal, Quebec City, Gatineau, Sherbrooke, Trois-Rivieres (Three Rivers), Saguenay, Drummondville, or any other city, town, village, or area in the Province of Quebec. The Spouse’s characteristics criterion is one of the Quebec skilled immigration selection factors, and up to 17 points are awarded under this category. The level of education of a spouse is worth up to 4 points, their training area up to 4 points, their age as many as 3 points, and their proficiency in French language oral interaction up to 6 points. The minimum score required of an applicant with a spouse or common-law partner is higher than that of a single applicant, so even though unmarried applicants are ineligible to receive points under this category these are certainly not "bonus points." Skilled Worker Program Quebec applicants who have received a validated permanent employment offer can be awarded up to 10 points under this selection factor depending on the location of the job. Candidates for skilled worker immigration to Quebec who will be bringing their children to Canada are eligible for up to 8 points under this selection criterion. Quebec Canada Skilled Worker Program applicants are eligible to receive one point under this "Financial Autonomy" qualification category should they meet the Quebec immigration minimum settlement funds requirement. The Government of Quebec requires potential immigrants to possess a minimum amount of money that is determined by the number of family members immigrating and their ages. Applicants who sign the Quebec Immigration Skilled Worker Program financial agreement stating that they possess the required funds will receive a point for this selection factor. A score of 1 point in this category is required in order to be eligible for the Skilled Worker Program. Prospective immigrants who do not sign the declaration that they satisfy the Quebec Skilled Worker minimum funds requirement will not be eligible to participate in the program. Please note: in order to keep up with cost of living increases, the Ministère de l'Immigration, de la Diversité et de l'Inclusion (MIDI) will occasionally update the required settlement funds for Quebec immigrants. We will do our best to keep these amounts updated, but please be aware that they may not always be precisely correct. There is a mandatory Government processing fee for applying to the 2018 Quebec Skilled Worker Immigration Program. Example: a family consisting of a husband and wife and two children would need to pay a Government of Quebec Skilled Worker Program fee of $1,271 ($773 + $166 + $166 + $166). What is the Highest Possible Quebec Skilled Worker Score? Although extremely unlikely, it is possible for an applicant to attain a QSW Canada immigration score of 116 (26 + 8 + 16 + 22 + 8 + 17 + 10 + 8 + 1). To do so, he or she would need to have a PhD in a Section A area of training, have more than 4 years of eligible job experience, be 35 years of age or under, be exceptional at both French and English, have close family living in Quebec, have previously worked or studied in the province, have a validated Quebec job offer, have 2 or more children also moving to Canada, be financially self-sufficient, and have a spouse or partner that is also young and highly educated in an ideal industry. The minimum cutoff score for participating in the Quebec Canada Immigration Skilled Worker Program is 50 points for single applicants and 59 points for couples. 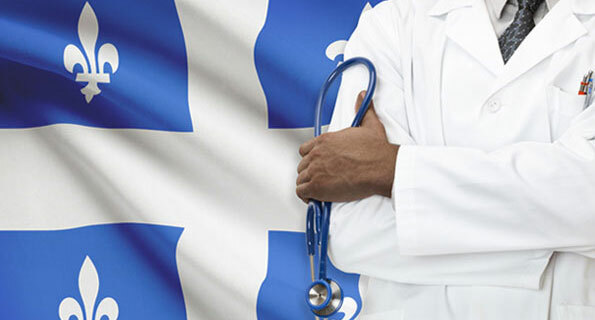 The Quebec Skilled Worker Program requirements were changed in 2015, lowering the score required to obtain a Certificate de Selection du Quebec (CSQ). The Adaptability selection factor was also removed from the points-based Quebec immigration program. As a result, the adaptability interview is no longer a requirement of the Canada Immigration Quebec Skilled Worker Program. Previously, attending a scheduled interview was an obligatory element of the QSW Program application process. Now it is no longer mandatory, although Immigration Quebec retains the right to conduct QSWP interviews should they wish to verify in person settlement plans, authenticity of documentation, language proficiency, relationships in Quebec, or other aspects of a candidate's application. The Quebec immigration points grid was updated again in 2017. The minimum points required for single applicants was increased from 49 to 50, and the number of points required for married couples was raised from 57 to 59. The 2018 Immigration Quebec Areas of Training list was also updated. In addition to these changes, the Government of Quebec has been steadily improving the "Mon projet Québec" online immigration system, and it is now better than ever. The new Quebec immigration rules for skilled workers favor potential candidates who have been trained in a "preferred area" or who have a validated offer of employment in the province. In 2018, the Education sub-category is more heavily weighted than the Areas of Training sub-category, which means what a person is trained in affects their eligibility to migrate to Quebec less than the actual level of education they have attained. The Quebec Immigration Skilled Worker list of occupations has also been enlarged, and points are now awarded for an exceedingly wide range of degrees and diplomas from foreign and Quebec institutions. Canadian immigration for Quebec skilled workers is more consistent and objective than ever thanks to the new ranking formula, and many subjective elements such as the in-person interview have been removed. The new and improved Quebec immigration eligibility criteria for the program should prove to be more effective at identifying human capital with strong credentials. Immigration to Quebec without speaking French is possible through the QSW Program provided an applicant is awarded enough points from other categories of the selection grid to attain a passing score. French language proficiency is worth up to 16 points, so even if you are excellent at English, you will need to be very competitive in other categories to exceed the pass mark if you do not understand or speak French. Can I Immigrate to Other Canadian Provinces via the QSWP? Under Canadian immigration rules, skilled immigrants who wish to reside in Montreal or other areas of Quebec are selected based on different criteria than those who wish to settle in the rest of Canada. This is why the Province of Quebec has its own skilled immigration program, officially called the "Regular Skilled Worker Program Quebec." All Quebec Skilled Worker Program applicants should intend to reside in Quebec. Although the Quebec immigration program gives successful participants unconditional permanent residency in Canada, enabling them to live, work, and study in any Canadian city, it is specifically designed to attract skilled workers to the Province of Quebec. Individuals and families that do not genuinely wish to live in Quebec should not apply for the QSW Program. Instead, skilled workers who wish to reside outside of Quebec can consider applying to the Federal Skilled Worker Program Canada (FSW). To learn more about the Federal Skilled Worker Program and Canada Express Entry, click here. It is mandatory to use the "Mon projet Québec" online immigration service to begin the Quebec Skilled Worker immigration process. The last Regular Skilled Worker Program intake period ended March 31, 2017, and a maximum of 10,000 applications for a Certificat de sélection du Québec (CSQ) were accepted under the program during this time. A highly anticipated Quebec immigration 2018 intake period accepting a maximum of 5,000 applications should be announced soon. Candidates who are already temporary residents of Quebec with a job offer validated by Quebec immigration authorities are permitted to apply for immigration under the program at any time. Not interested in spending time using the Mon projet Quebec immigration portal? Our Quebec Skilled Worker Program application service helps prospective immigrants apply to legally move to Quebec as skilled workers. Immigration to Quebec as a skilled worker also involves requesting federal approval from Citizenship and Immigration Canada (CIC). Our Quebec Skilled Worker immigration application service is available for both the CSQ application component as well as the subsequent application for Canadian permanent residency. Which Canadian Visa Offices Process Quebec Skilled Worker Program Applications? The following Canada Visa Offices accept Skilled Worker Quebec applications. Individuals and families applying for the Quebec Canada Immigration Skilled Worker Program must support their application with supplementary documentation. In addition to the Quebec Skilled Worker application form (Immigration Quebec form A-0520-AA "Application for Selection Certificate - SKILLED WORKER"), the following supporting documents should also be included with a QSWP application. The application form for a Quebec Selection Certificate (CSQ) under the Skilled Worker Program asks a wide variety of questions and includes comprehensive instructions. The official Quebec immigration application asks questions regarding the applicant's identity, marital status, residential address, family members, dependent children, offer of employment in Quebec validated by the MIDI, as well as if the prospective immigrant is currently residing in Quebec as a student or temporary foreign worker. The Immigration Quebec application forms also ask for the title and code of any degree or diploma attained, if the applicant has ever applied for a temporary stay, permanent residence, or refugee status in Canada, every location the applicant has lived in the past ten years, his or her thorough educational history, and all the jobs held in the past five years as well as the precise tasks performed at each job. The Quebec Skilled Worker application also asks for meticulous information regarding any visits to Quebec in the last ten years, English and French proficiency test scores, which city or region of Quebec the applicant plans to reside in, intended occupation once living in Quebec, and whether or not the applicant has retained the services of a Quebec immigration lawyer or consultant. Skilled Worker Quebec applicants must also sign a declaration on the common values of Quebec society, and spouses or common-law partners must also sign a declaration regarding their relationship with the main applicant. Quebec selected immigration is assessment based, and only qualified individuals will be invited to settle in the province as a permanent worker. The process to obtain PR in Quebec involves procuring a CSQ and then applying to become a Canadian permanent resident. Using a calculator and the skilled immigration points grid provided above, it is possible for interested parties to determine if they are eligible to participate in the program. A Quebec immigration lawyer or regulated Quebec immigration consultant (RCIC) can also help determine QSW Program eligibility. We update this website frequently, so please check back often for the latest Quebec Skilled Worker news and rules. In addition to updated Quebec Skilled Worker requirements, processing times and news, we will also share any changes made to the Immigration Quebec selection grid for skilled workers. The official Quebec immigration website is also an excellent source of information and news. Click here to visit the Quebec immigration official website which also contains the Quebec immigration office contact info. Please note: some people casually refer to the Skilled Worker Program as the "Quebec PNP Program." This is not an accurate term, however, as Quebec is the only province in Canada without an official provincial nominee program since they handle their own immigration outside of the federal system. Questions about Quebec immigration for skilled workers? Contact us today for a free consultation.